« Win a $10 Whole Foods Giftcard, also Malbecs! The recipe for the soup can be found online here at the Chicago Tribune. I decided to give mine a little more ooomph. One of my favorite French soups are the ones with a pistou on top – so that’s what I did here. The verdict: it was really good. We ate the rest of the pistou with some crackers (which is how most pistou/pesto leftovers come to their end here). 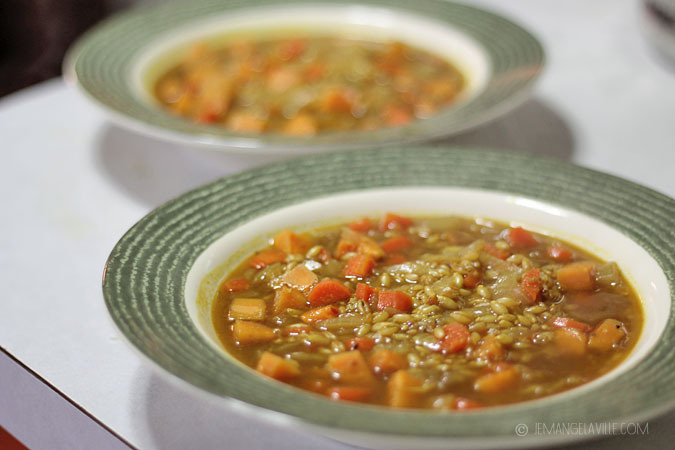 Here’s a link to everyone’s vegetable barley soups this week. And the Cilantro Pistou recipe is below. Add the cilantro, feta, almonds, and lemon juice to a food processor and process for a few seconds until everything is chopped up. 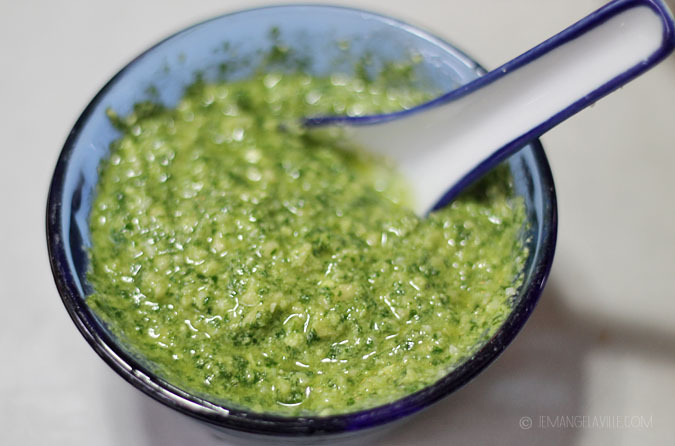 Drizzle in olive oil (1/4 – 1/2 cup) until it is the consistency of a pesto. Add salt and pepper to taste and add more cheese, almonds, or lemon if you’d like. 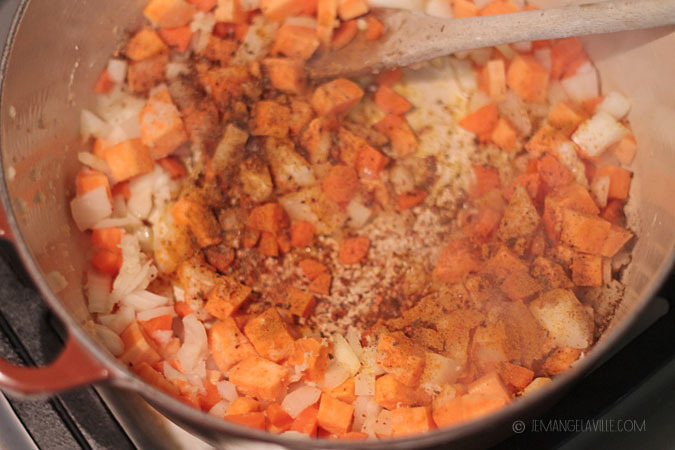 Let sit until ready to top the soup (if it’s more than an hour, store in the refrigerator). Leftovers are good with crackers. Or a spoon. Your soup looks fabulous and I love the topping of Pistou. Wonderful photos too. I adore this idea for a cilantro pistou! Great idea. I can think of a lot of great uses for it! Mmm… Beautiful photos! 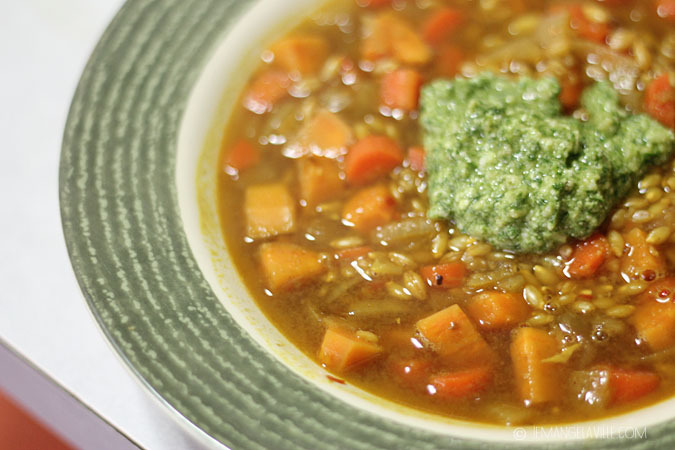 Your soup looks great with the pest on top – nice touch. Thank you for the Cilantro Pistou recipe! Lovely pictures and love those green soup plates! 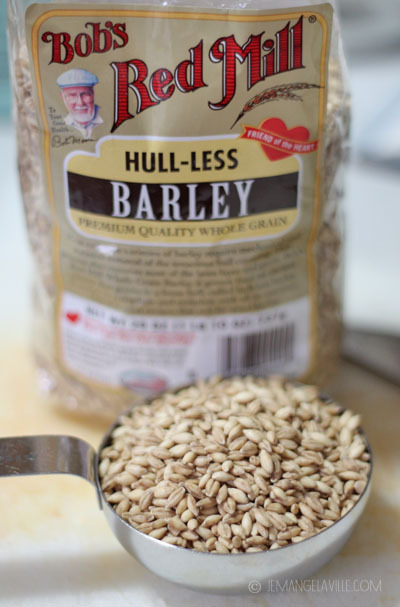 I think we all assumed that a barley soup would be a whole meal… I’m feeling now that this was meant to be a starter… it seemed to leave most of us feeling like we needed more. Ok, what does the pistou add? ….. tangy? refreshing, cool flavor? I love the idea, but I can’t wrap my mind around the flavor it would add – although it is darn pretty in your photos!! Cher: Yeah, I thought the creamy cilantro flavor/texture was perfect. Diane: This was a light dinner for us, but we definitely also had some crackers on the side. The cilantro pistou sounds fabulous, Michelle! I’m imagining so many things I could use that on. Can’t wait to try it. Your cilantro pistou sounds delicious Michelle! Your photos are really good! I really like the idea of Pistou…but I intensely dislike cilantro! Funny it’s one of the few flavors that I just can’t eat! Parsley would work for me! 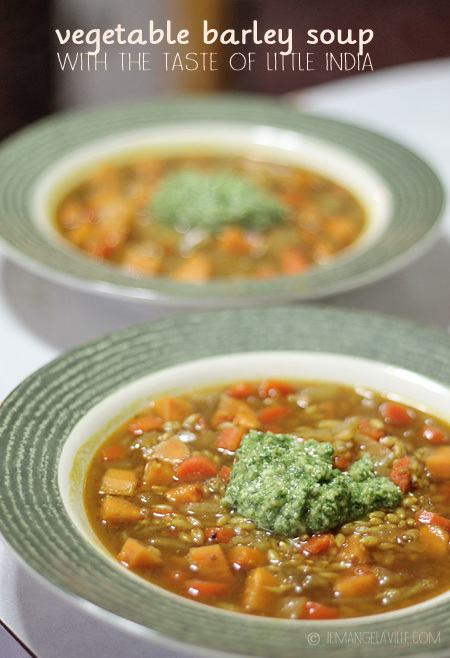 Your soup looks lovely in the green soup plates with the green pistou on top! Nice photos! What a nice addition! I’m looking forward to making pistou (the soup) this spring. It’s one of my favourite ways to usher in the season.